-Every year there's a player who puts up outrageous numbers in a season shortened by any number of factors. That player this season is C.J. McCollum, who ranked third in overall usage at 20.8 possessions per-game and first in scoring efficiency at a tremendous 1.104 points per-possession. Ranking second in both transition scoring efficiency at 1.26 PPP and half court scoring efficiency at 1.065 PPP, it was McCollum's prolific jump shooting prior to injuring his foot that helps him here. Connecting on more than 50% of his jump shots overall, with splits of 49% off the dribble and 61% off the catch, McCollum leads this group in field goal percentage on the pick and roll and in spot-up situations and ranks second one-on-one thanks to his hot perimeter shooting as a senior. Knocking down 36.6% of his jump shots in 35 games as a junior, McCollum clearly benefits from some sample size bias, but has a proven track record of being able to put pressure on opposing defenses with his ability to score from all over the court. A slightly above average finisher and foul drawer, if McCollum has a true weakness on paper in this limited sample of games, it is that his profile reinforces that the role he filled was more aligned with playing off the ball than those of his peers. He did less creating for his teammates on the pick and roll than any player other than Lorenzo Brown at 2.6 pass outs to possessions per-game, well below the average of 6.1, and used screens without the ball to get open for 12% of his possessions, almost double the next closest player in this group. Doing what he needed to as a scorer to lead Lehigh to wins, McCollum has acknowledged in interviews that he's prepared to make whatever adjustments he's asked to make as a lead guard at the next level to fit in stylistically. Playing in relative obscurity to the basketball viewing public in the Patriot League, junior guard C.J. McCollum was introduced to the national audience with an incredible 30 point, 6 rebound, 6 assist showing as Lehigh upset 2nd seeded Duke in the first round of the NCAA tournament. It wasn't McCollum's first appearance in the national spotlight, as the Mountain Hawks played Kansas tough the first round of the NCAA tournament during McCollum's freshman season, a season that saw him lead all freshman in scoring at 19.1 points per game. But for a player on the fence about declaring for the NBA draft who had previously struggled in his limited appearances against top competition, this was exactly the kind of coming out party McCollum needed to put his name in the basketball worlds collective conscience, and a perfect recap to what has been a very good bounce back season for the focal point of the Lehigh offense. 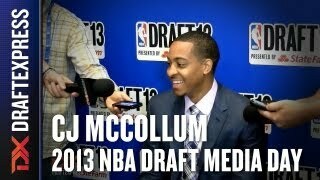 McCollum is a 6'3 lanky combo guard with solid length. Coming into Bethlehem, Pennsylvania as a 160 pound freshman, McCollum has done a good job of adding strength to his now 190 pound frame, although he still must get stronger in order to effectively compete with NBA guards. McCollum isn't particularly explosive around the rim, but he's a quick, fluid and very smooth athlete with terrific ability to change speeds and utilize hesitation moves to create offense for his team. McCollum has improved as a passer, averaging 4.2 assists per 40 minutes pace adjusted, by far a career best. Most intriguing has been his court vision coming off pick and rolls, particularly useful considering his ability to generate his own offense in those sets and the likelihood he will be placed in that situation at the next level. That being said, McCollum is first and foremost a natural scorer. His 25.8 points per-40 ranked him 6th amongst NCAA prospects, while he was able to improve his efficiency significantly from his somewhat disappointing sophomore season, as his 2-point percentages rose from 43% to 50%, his true shooting percentage rose from 52% back up to 57%, and his three point percentage settled in at a much more respectable 35.3%. McCollum is very comfortable shooting off the dribble, with a combination of pull-ups and step back jumpers that allows him to get shots off over bigger defenders. This allows him to be effective as a scorer off pick and roll sets, which will likely be his bread and butter in the NBA. This year he's also used that attention to set his teammates up better, a key ingredient to allowing him to become a better setup man than he has been in years past. McCollum has also improved his mid-range game, shooting a solid 38.2% on those attempts, a vast improvement over the 27.3% he shot as a sophomore, according to Synergy Sports Technology. The development of a lethal pull-up jumper has been crucial for somebody who isn't a terribly explosive finisher at the rim, and makes him tougher to defend. One area where he still at times struggles has been as a spot-up shooter, shooting just 35.5% on catch and shoot opportunities. Much of this could be attributed to the defensive attention opposing teams pay to him, as the majority of his catch and shoot opportunities are contested, something that should change as he moves to being more of a complementary player at the next level. He shot a more respectable 40% on uncontested catch and shoot opportunities, against 32.6% on contested shots, although this is on somewhat of a limited sample size, as McCollum has been the focal point of the Mountain Hawks offense since the moment he set foot on campus. He has also had some success shooting coming off screens, lending more credence to the belief that he could see some time playing off the ball if paired with another playmaker in the same backcourt. In terms of creating off the dribble, McCollum has good, controlled ball-handling skills and does a very good job of changing direction and speeds, allowing him to get into the lane virtually whenever he wants. He's not the greatest finisher at the rim due to his average explosiveness at the rim, but he has good body control and touch around the hoop, and this year saw his field goal percentage around the basket increase substantially, to 50.5%, up from 35.6% the prior year. He'll likely never be a Derrick Rose type finisher at the rim due to his average strength and explosiveness, but his willingness to go get into the paint and draw contact will serve him well. McCollum's 8.2 free throw attempts per 40 minutes pace adjusted ranks 6th in our database amongst top-100 prospects, further illustrating how much of a complete all-around scoring weapon he's become. Another area where McCollum excels is in transition. Extremely fast with the ball in his hands, his excellent defensive rebounding ability (7.6 defensive rebounds per 40 minutes pace adjusted, #1 in our database amongst guards) combined with his ability to generate turnovers (3.1 steals per 40 minutes pace adjusted, #1 amongst all college prospects) provides him ample opportunities to get out and run. On the defensive end, McCollum is still somewhat of a mixed bag. He is clearly undersized, both in length and in strength, to defend the shooting guard position. He also has a tendency to put himself out of position when gambling, although with the amount of steals he generates, this was likely by design. But the effort and especially the anticipation skills are there, and in a smaller role where he's not forced to shoulder an entire college team's offense, he has the potential to be fairly effective, especially defending point guards. It's hard to take too much out of a short tournament run, but for a player who has clearly been one of the most productive guards in all of college basketball, McCollum success -- and the success of the team -- against Duke was an eye opening performance. While McCollum won't have the offensive freedom he had at Lehigh, he shouldn't have too many problems finding a role in the NBA, at the very least as a spark off the bench, something that is very much in need in today's NBA.